Sometimes all it takes is sheer dedication, faith, and conviction in your idea to turn it into a successful business idea. Not many people have the courage to follow their dreams, keep the faith and walk the path of uncertainty to achieve the unexpected, but those who manage to do so, change their lives forever. Something similar happened with Shashank Shekhar of Stoned Santa. On the night of 5th August 2018, Shashank Shekhar along with his intern Sanjay Nalamaru, set out to execute the biggest and one of its kind marketing campaign for his startup. 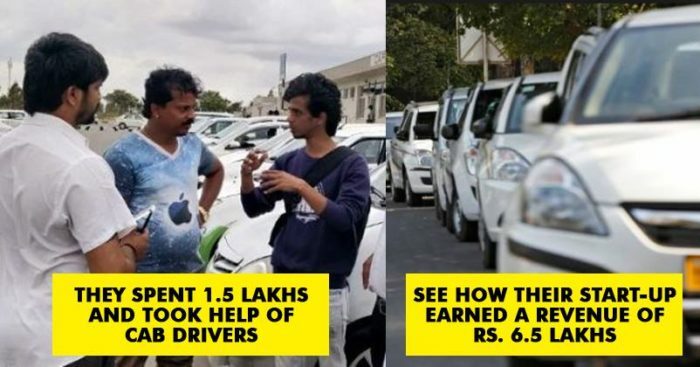 This marketing campaign not just helped his startup earn handsome revenues but also give some life and marketing lessons that will remain with him forever. 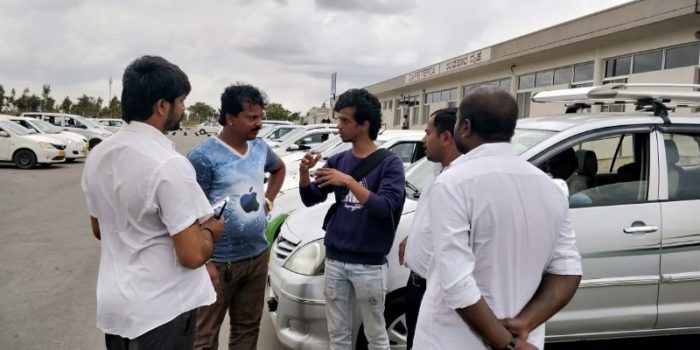 He spent more than 40 hours at the Bangalore Airport and interacted with more than 600 cab drivers and managed to convince 400 of them to advertise Stoned Santa in their cabs. 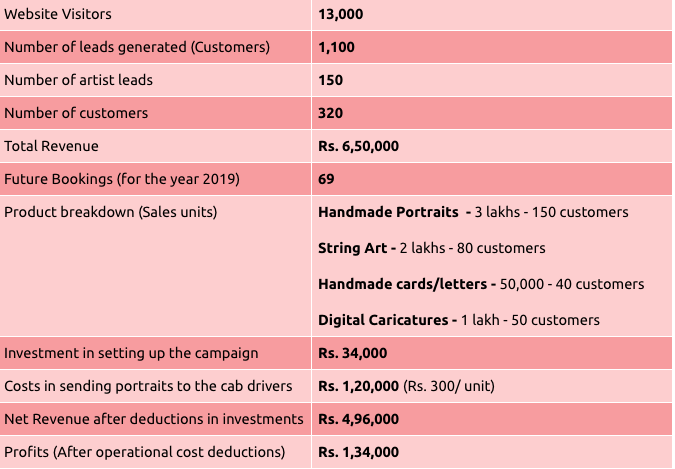 Here are the details of the campaign right from its inception to execution and everything in between. Startups are anything but easy and most of them come with their sets of highs and lows. One day on way back from his office to home, Shashank got talking to his cab driver and a few minutes into the conversation, the driver told Shashank how he served as a door to door salesman selling encyclopedias and this when Shashank mentioned Stoned Santa to him. 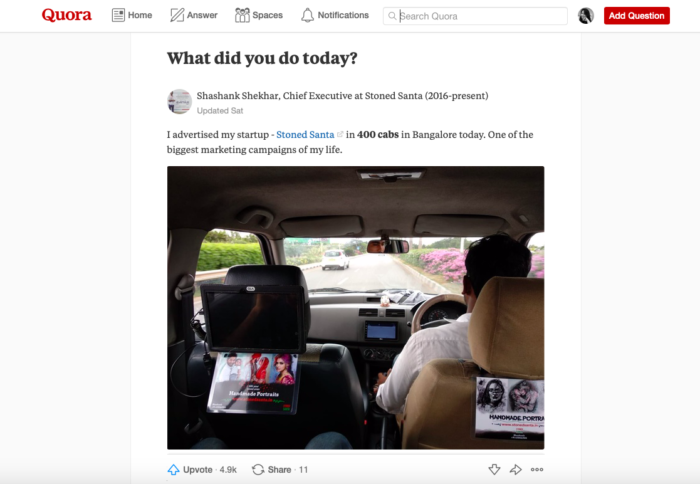 After discussing the traditional and digital methods of advertising, the cab driver suggested Shashank try something different since his was a creative business. 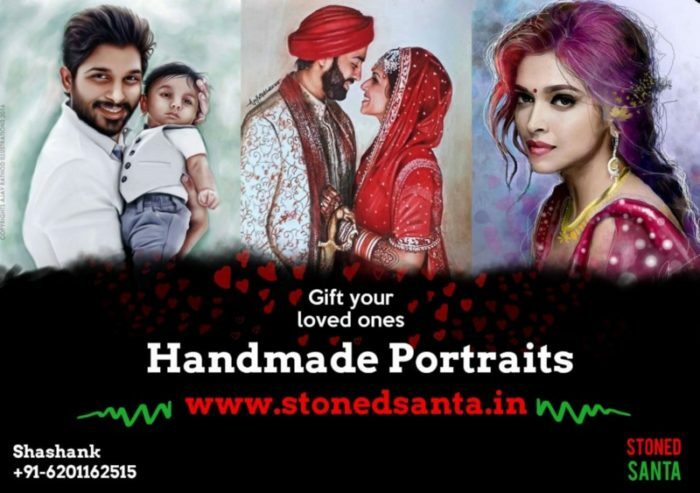 In that spur of the moment, Shashank asked the cab driver that would he be interested in advertising about Stoned Santa in his cab, to which the driver responded positively. Shashank took his contact details, thanked him and turned back happy and excited than before. He suddenly felt he found the right way to market his business. 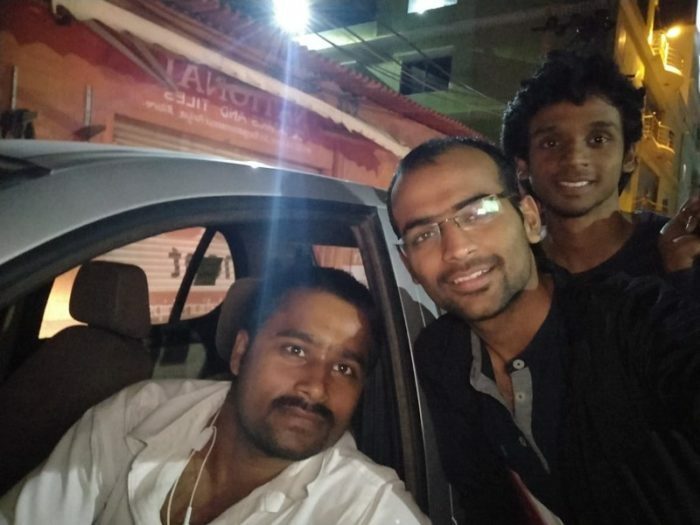 His got positive vibes about his idea and he started interacting with many cab drivers for over a month. He collected some data from nearly 100 rides that he took with cab drivers and this data helped Shashank understand and plan the campaign better. He felt confident that the cab riders would surely notice their advertisement in the cab, as they would place the brochure right in front of the eyes. He also felt confident about the uniqueness of the name of the company ‘Stoned Santa’ and thought it would definitely attract people to look through the brochure. Based on the data collected, Shashank arrived at some assumptions and calculations to arrive at rough numbers on how many conversions they were expecting. With 800 printed brochures, cans of red bull, the strategy, and determination in their hearts, they set out to launch their campaign. And in order to find many cabs at one point, they opted for the Bangalore Airport and at 9 PM they started their journey to what now is a successful marketing campaign. Within minutes of getting into the cab, they began their first pitch in a mix of broken English, Hindi, Kannada and sign language. “Anna… Hi! I’m Shashank! My startup helps people find the right gift for their friends and family and we help spread joy and I’ve been doing this since college. A few minutes into the ride the cab driver noticed that they had lots of brochures with them and asked what they planned to do with those. This served as a perfect kick-start for both Shashank and Sanjay who left the cab beamingly with hopes of converting other 399. But things didn’t come them as easy. To their disappointment, by the team they reached the airport at 11:45 PM, the parking lots did not have much of cabs, in first 3 hours they only managed to convince 20 cab drivers. But giving up was not a choice, so they took a break for sometime and waited patiently. At 4 AM, the parking lot was buzzing with cab drivers and soon they found themselves giving their pitch to a group of 4-5 drivers in one time. It wasn’t a cakewalk and they even faced rejection from more than 250 drivers, but they held on. What did they offer the cab drivers? They offered the drivers digitally made portraits of their loved ones but to their surprise, a lot of drivers accepted to keep the brochures without needing anything in return. After almost 40 hours of their adventure at the airport, they were live in 400 cabs! This feeling of achievement and accomplishment was greater than anything previously experienced. 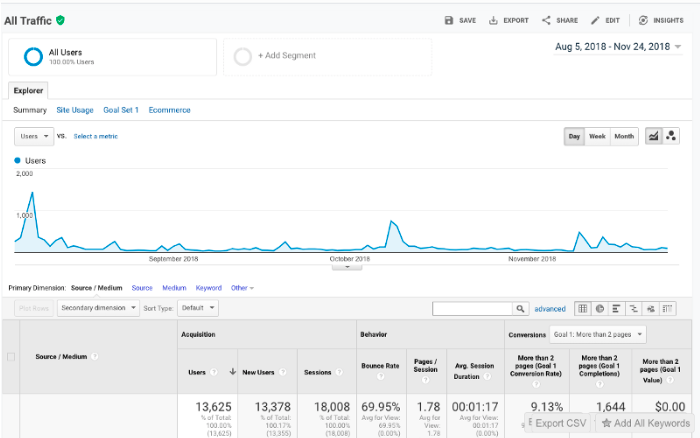 To further ensure that the campaign had really worked, Shashank posted on Quora about his campaign and within 48 hours of writing it, it had over 40,000 views with 4000 upvotes and sent almost 1300 visitors on their site. They broke even within 72 hours of taking the campaign live and the campaign not only taught Shashank the marketing tactics but he also got familiar with the human side at a greater level. He was touched by the humility of cab drivers and how eager people are to help each other. These things have only helped soar his determination and we are sure that his story is an inspiration for many who dream.